Myanmar-based drug peddlers have threatened to kill Tripura Chief Minister Biplab Kumar Deb- claimed BJP. 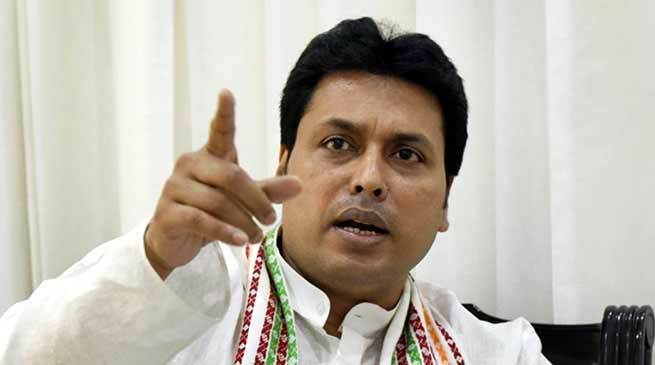 Myanmar-based drug peddlers have issued a threat to the life of Chief Minister Biplab Kumar Deb as he has called for making the state drugs-free, the ruling BJP in Tripura has claimed. Addressing a press conference veteran BJP leader and former minister Ratan Chakraborty informed that ” on Tuesday that Union Home Minister Rajnath Singh had received reports that drug peddlers in Myanmar had hatched a conspiracy to eliminate Deb”. “We have also got inputs from our party sources,” Chakraborty informed to the media. He also added that drug peddling circuit in North East region have taken a hit since the BJP-IPFT government came to power in March this year and drug peddlers based in Myanmar have taken it very seriously. As per reports, over 50 thousand Kg cannabis was recovered along with narcotic pills, heroin, brown sugar, and other intoxicants during the last six months. Over 120 persons were arrested in connection with drug cases. “Drug peddlers are scared because their business has taken a severe hit. “So, they have hatched a conspiracy to kill the chief minister,” the BJP leader said. However the state police keep silence on the matter. Chakraborty said the BJP workers were also asked to ensure that the chief minister’s security cordon was not breached under any condition.